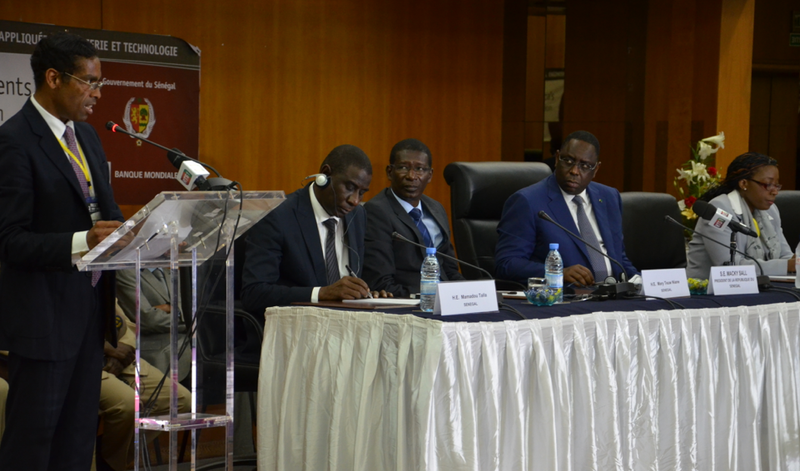 I was delighted to join the World Bank Applied Sciences, Engineering and Technology Conference in Dakar this week, and give the keynote to the session: The way forward: Business for the Scientific Independence of Africa, as well as be invited to give my conclusions to His Excellency President Macky Sall. “I am delighted to tell you all today that as a result of our work with the World Bank and a new agreement signed just last month, we at the Planet Earth Institute will be working to help bridge that gap between business and science in Africa. “Personally, I will be leading a new group of ten African Business Champions for Science, who will become a loud voice for the change we want to see. These entrepreneurs will represent the new face of business in Africa, conscious of investing for the long-term future of our continent. Over the next few years, the Champions group will develop ambitious projects and programmes to attempt to better connect business and scientific communities, and we open our arms to all you here today to work with us. “For African entrepreneurs like me, who have spent decades working to create successful companies on the continent, investment in science, technology and innovation is now a priority. We must work in collaboration with Governments to better align our business interests with science and technology. “I have already seen the benefits of this approach. In Angola, I have been working with local businesses and Agostinho Neto to develop a new PhD programme with Newcastle University that will offer world-class training to Angolan students. Working with the private sector in Mozambique, we are developing a similar programme with Eduardo Mondlane and Glasgow Universities. And in Ivory Coast and Cameroon, I am investing in the latest ICT technologies specifically designed for university students, giving young people the access to fast internet connections that can help transform their learning process. “Projects like this are not about charity. They are about investment in growth and success for Africa, helping build the environment that can offer businesses, entrepreneurs and everyone big returns. While I am an African businessman I am also a father and just like everyone I want the best for my children. But at the moment, often there are better opportunities in Europe, Asia and the Americas than in our home. That must change. We must all work together to ensure that Africa is the destination for young people, and that it can provide all our next generations need to thrive. “The first project I will take to the Africa Business Champions is to support a new Regional Scholarship Fund for PhDs, with a goal of 10,000 African PhDs in the next ten years. We want these PhDs to be working with local businesses from the start, with work placements and sponsored research, to ensure that work undertaken by PhD students is useful to local economies and industries. Scientists need to know and understand business, and young entrepreneurs must know the value of science too. Projects like this can help achieve not just a new generation of scientists, but a new generation of scientific leaders able to turn inventions, patents and research into jobs, security and prosperity. “In closing, I think it is clear to see that business and science in Africa must be better linked. Entrepreneurs and business leaders need to increasingly invest in local research, scholarships and research and development, and they need support from Government and elsewhere to do it. I am delighted to know that your ambition and dreams is about develop African Continent, specifically Angola. I been follow your blog for a while and l am quite sure that your vision of future is fascinating. I am an Angolan citizen who emigrate to Europe when l was 18. Now I am 35 married with two children, l can assure that the future is scared. Recently l graduate in England in Business Management and International Business, l have been looking for an opportunity in my country, unfortunately have been unsuccessful. When Angolan Entrepreneurs realize that the recruitment system in African doesn’t appeal to the Angolan people, there we will have a debate. It’s important to put in place, mechanisms to attract high qualified Angolan nationals all around the world, in order to create a developed nation, otherwise we will be dependent of the International support forever. Without any more comment, l believe that leaders like yourself are capable of move this beautiful continent forward.